I used to play piano so I kind of remember the basics of reading notes. But I wasn't meant to be Mozart because of one big thing: I sucked. Also! Carrying all that sheet music was silly and annoying. iSheetMusic stores it all on your iPad. It's a sheet music reader for the iPad. 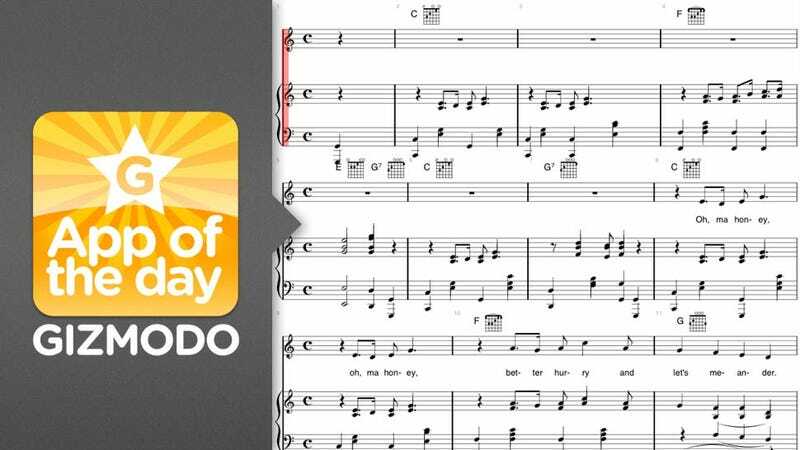 The app is free and comes with a few classic song sheets (Amazing Grace, Take Me Out to the Ball game, etc.) but every other song you'll have to buy in their small but growing collection. Sadly, you can't upload any sheets on your own, you'll have to rely on their store. What's great is that the app has a built in metronome (audible or visual) so you can keep your tempo right and see where you are in the piece. Also great: automatic page turning as the app will flip the page once you reach the end of the previous one. Right now, the app holds a lot of promise for a future convenience. Think about being able to buy a guitar clamp that'll hold your iPhone as you strum it, the app will even show you certain chord arrangements. Or if you're on the piano, the visual metronome will never let you lose your place (or pace), flipping the pages automagically for you. No more of that awkward hand dance to get the pages right while you hold the note. Searching for songs to buy could be a little more elegant (it's very, very bare bones right now) and I wouldn't even mind the option to hear the song you're playing on your iPad either.